King’s Baptist Grammar will develop a $30 million campus on 5ha it has bought in the Newenham estate on Bollen Rd. It will open in 2021 to students up to Year 2, then gradually extend to Year 12. A partnership with Mt Barker Baptist Church, the campus will have sport, art and performing arts centres from the outset. Science, home economics and tech studies centres will be added later. 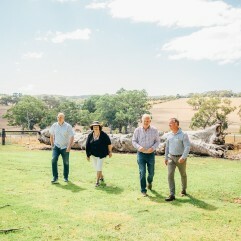 The school will be next to a recreation reserve and Mt Barker linear trail, which will be extended to finish a 12km walking and cycling loop through Newenham, Mt Barker and Laratinga wetlands. King’s Baptist, which has operated its Wynn Vale campus since 1983, currently charges $5420 for junior primary and $7490 for Year 12. A masterplan for the new campus will be unveiled mid-year. The middle school will be completed by 2029 and extra science labs by 2032. King’s Baptist principal Russell Eley, who has been in the role since 1996, will oversee the project until a principal for the second campus is appointed in 2020. Mr Eley said King’s Baptist had “grown to have a strong reputation for academic excellence, performing arts and sporting achievements” and wanted “to give families in the hills the same learning opportunities”. 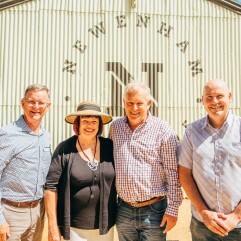 Burke Urban’s $350 million Newenham is a 730-home development to be completed over the next decade. Managing director Kym Burke said the school would provide more choice for parents when assessing education options in the area. 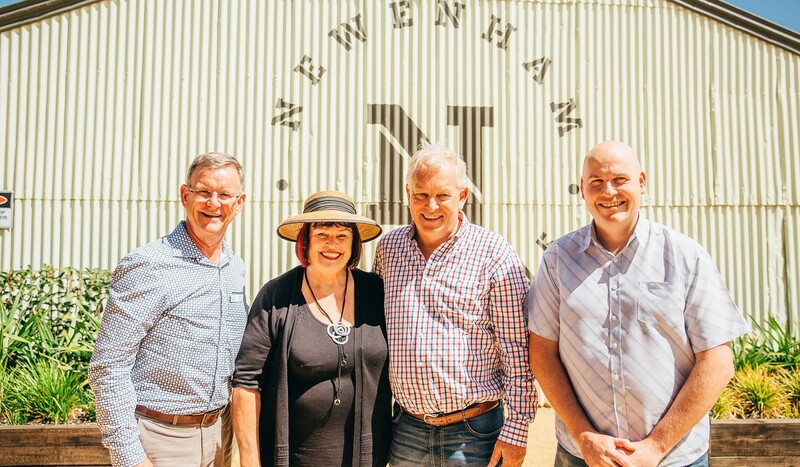 “We are excited that our Newenham residents will have access to quality private education just moments from their own home and will be able to travel to the facility on foot or bike by a beautiful linear park trail along Western Flat Creek,” he said. Mt Barker Mayor Ann Ferguson said the site had been identified in the council’s growth plan as “ideal for a school”. She said it would allow for a “strategic partnership approach” between the council, the school and the developer for use of neighbouring council land “purchased for future development of recreational facilities”. The school will cap class sizes at 28 and offer after-hours care. Enrolment applications will open next year and be confirmed in 2020. Children will be able to attend the early learning centre without a commitment to attend the school. Article written by Tim Williams, Education Reporter, The Advertiser. Appeared in The Advertiser on Tuesday 13 February 2018. 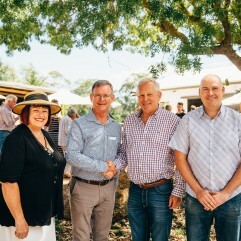 Photo: Launching the new school at the Newenham Resident’s Event were Russell Eley, Principal of King’s Baptist Grammar School at Wynn Vale (left), Mayor Ann Ferguson, Kym Burke from Burke Urban (Newenham) and Cameron Hawke, right, from the Baptist Churches of SA.